Hi, my name is Betty. I am the guest blogger for the day. I work in lots of areas here at MMS. I really like potpourri, so today I am going to show you a different style of potpourri. Moving from one home to another, I decided I wanted something different in potpourri. Something different in the smell, the beauty of colors, and the container it was in. After finding what I needed in the MMS catalog, I decided to venture that direction. My project today is simple but beautiful and easy. Put 16 ounces of salt crystals in large zipper-style plastic bag. Add three 0.15 cc scoops of Aqua Mica. Close bag and shake until all crystals are coated evenly. Add 1 teaspoon of Dream Fragrance Oil in bag and shake. 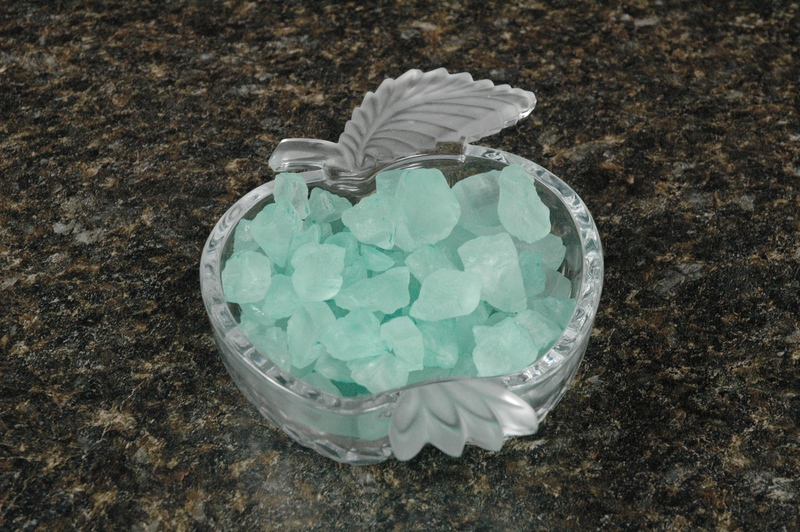 Put on a plate to allow fragrance to penetrate all pockets and cracks of the salt crystal. Put in your desired glass container. Wow! Always choose a glass container for displaying your salts. Fragrance oils are strong solvents and will break down plastics. Making these potpourri salts has been so much fun and what great gifts to make. Try it and enjoy! Pour salt into zip bag. Adding the mica to the salt. All the mica added to the salt. Kneading the salt and mica together. Pulling the salt out of the corner of the bag. The salt is almost mixed. Ready for the fragrance oil. Fragrance oil on the salt. Mixing in the fragrance oil. Checking the salt for dry spots. Pouring the salt on a paper plate. Salt sitting on a paper plate to dry. Dry salt in a pretty glass dish.